Official synopsis: "Having escaped from Hong Kong, the Five Gatekeepers - Matt, Pedro, Scott, Jamie and Scarlett - are scattered in a hostile and dangerous world. As they struggle to re-group and plan their next move, the malevolent King of the Old Ones gathers his forces in Oblivion: a desolate landscape where the last survivors of humanity must fight the ultimate battle." When you are dedicated to a series for so long, from start to finish as it were, the end is always such a bitter-sweet moment. You're looking for a great conclusion, all the threads of the story brought together, and tied in a pretty little bow so that it all makes sense. You want a sense of closure, both for yourself and for the characters. But then it is also a sad occasion, as you know the characters you love so much are all about to be left behind, no more adventures, you've reached the end of the line. 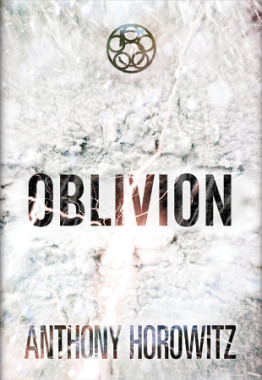 Oblivion is such a book for me. I remember reading Raven's Gate when it first come out, way back in 2005. I'd always loved Anthony's work, and while I enjoyed the Alex Rider series, Raven's Gate really got me going, it got me excited, and I loved it. For me, The Power of Five is a fantastic body of work - all five books - and is easily the best thing Anthony has written. From the start of Oblivion, it is clear that the world as we know it is gone, and the world as it stands now, albeit ten years in the future, is hanging in only by a thread. Things are changing and at a rapid pace. Economies have crumbled and fallen away, governments have been extinguished, chaos reigns, and indeed Chaos, King of the Old Ones does indeed reign. There's no order any more, and things are only getting worse. The Five appear, ten years later, scattered to the four corners of the globe, further apart than they ever have been before. But weren't they just in Hong Kong? How can they now be all over the world, and have skipped the last ten years? Oblivion itself poses many questions. Both regarding the series and it's characters, and on a wider scale. It's a tale of pure destruction. A tale of human self-destruction. Man turns on man in Oblivion. The Old Ones themselves initiate it, but this book is very clever in the way that it shows human behaviour and we can see that when faced with horror, we as a race, a species, fall. The book has really touched a nerve with me and made me think big time. Big time! I'll be honest, I like order. I like knowing what's going on, where I'm going and when, what time I have to be there, why I'm going somewhere, and so on. So the world that we're presented with within Oblivion terrifies me. I hate the thought of the End of the World. Just as much as everyone else does, right? When I knew this book would be just that, the End of the World, it did scare me a little before I even sat down to read it. But it's in a far more subtle and I want to say terrifying, way. Anthony has obviously put so much thought into this book it's unreal. There are so many parallels to what is going on in our own world today - and this for me only made the book all the more effective. The book has a real message and one that shouldn't be shied away from. And at 668 pages it is pretty damn epic. It's really hard not to say anything which is going to spoil it. By now, it's the fifth in the series, so much has happened, and is in the process of happening when you start the book, that pretty much anything I say will spoil it. So, thanks Anthony for making this book so damn hard to review! Well, that is a lie. The concluding scenes, set in Oblivion itself, in the frozen wastes of Antarctica, are stunning, both visually and superbly written, but I felt that because they were so action packed and well written, they seemed to flash by. I was left battered and bruised by what was going on, and I just sat there in a daze. I loved that section so much I read it again before actually going on to finish the remaining pages of the book. Yes, I'd of liked that section to of been a bit longer - but Anthony... wow! You have done yourself proud. Stunning. I'm going to finish this review before I do spoil anything, so I'll finish it like this. Please, whatever you do, do not let this extra-ordinary series pass you by. In a world at the moment that is filled with paranormal romance, yada yada yada, I do feel that truly amazing pieces of work, like this series, go amiss. I implore you to please, just pick up Raven's Gate, and see what I mean. This series is so intoxicating, so rich, that it just blows you away. Just do it. Please. My thanks to the awesome Paul at Walker, for my copy! P.S... And can I just say, wow, well done to the Walker design team. The book is a stunning thing to look at. I love how the cover actually glistens like snow. Beautiful! Grrr, another amazing book not available in north america yet. Great review Ryan! Full title and cover for ZOM-B 3 revealed! Spooky Reads - Recommendations this Halloween! Title and artwork for Insignia Book 2! Cover revealed for The Life Beyond!